About Album: After months of steady promotion, Wale’s new project, The Album About Nothing, has finally arrived and it doesn't disappoint. The DC native's fourth studio album features the likes of J. Cole, SZA, Usher, and Jeremih. Production is handled in part by JGrammBeats, and the legendary Jake One stops by to help out on "The Matrimony". Album Review: Wale’s Album About Nothing is presumably the most substantial rap/Seinfeld collaboration the hip-hop community will ever witness. The effort was derived around concepts and show titles from the nine season-long NBC series, which ran from 1989 to 1998. 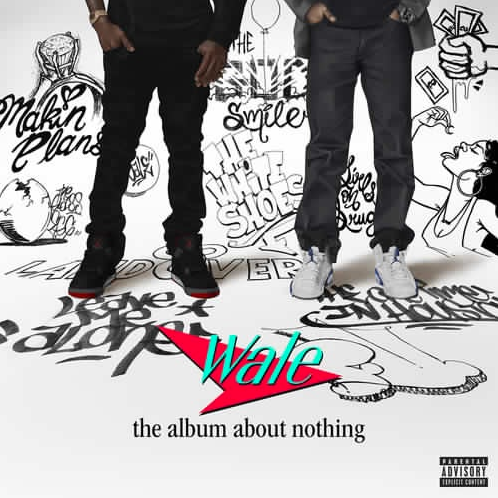 With his fourth studio album, Wale not only revisits pre-superstardom mixtape days—The Mixtape About Nothing was released in 2008; More About Nothing came out in 2010—but he, along with Jerry Seinfeld himself, crafts together hip-hop’s most notable nod to one of the best-written TV series of all time. But the idea is something we’ve seen before from Wale; he’s played up the Seinfeld angle for the past seven years now. Putting that aside, with his latest record, the MMG veteran brings forth a fresh, upbeat sound packed with emotion-stimulating rhythms that’s hard not to hold in high regard. As a trend of more substantially lyrical albums rises on the hip-hop scene this album continues the movement, filled with everyday tales of both triumph and tragedy. Wale introduces the album reflecting over the course of his career, spitting lessons of life and establishing a connection with his listeners. Trailing behind the intro track, “The Helium Balloon” marks the first appearance from Jerry Seinfeld, accompanied by MMG dancehall artist Magazeen who gifts a verse. The song crafts a narrative about striving for the ultimate height of success even while feeling constrained, a theme that recurs multiple times throughout the project. The Album About Nothing has an infectious, feel-good vibe with an undeniable cohesiveness. It’s clear Wale was going for a distinct sound, generally avoiding club-driven material in an attempt to create an album with songs driven by thoughts, beliefs and feelings. DJ Dahi is credited with instrument-heavy assistance on quite a few tracks, including “The Helium Balloon,” “The Middle Finger” and “The God Smile” (Each track name, as with each episode title from Seinfeld, starts with “The”). Jake One not only crafted one of the album’s singles, “The Matrimony” with Usher, but because he also worked on “The Glass Egg,” a song that takes the listener back to the 1970s. “The Pessimist,” featuring J. Cole and produced by Osinachi takes the title of most complex beat. Equipped with a choir-like sound, heavy piano and a tambourine, it’s hard to resist the appeal of a track about deterring negativity. “The Girls On Drugs,” probably the most party record, also encompasses praise-worthy production by blending the album’s theme with the first taste of club-driven material. There are only a handful of features on The Album About Nothing, but each one seems to be a wise, thought-out choice. Aside from Seinfeld’s commentary stringed between the records, J. Cole is the first feature heard on the LP. However, even though Cole sets the bar high, the collaborators that follow are fierce competitors. SZA is a great asset to the body of work, appearing on “The Need To Know” and crooning a rendition of Musiq Soulchild’s hit “Just Friends.” Jeremih and Usher fill out the tracklist; both appear on the album’s first two solid singles.